It's fun being a kitty for the day! Glitter Tattoos last 3-5 days & are waterproof! Adults love painting as much as kids. Skulls are popular in purple! Rainbow cakes help this face to go on quickly. Girls love, love, love bows! Boys love to be Superheros! She wanted an owl and this was my first ever. Masks are a specialty of mine. He's a mean one, Mr Grinch! Boys love to be wolves! Painting on the Oasis of the Seas cruise ship! 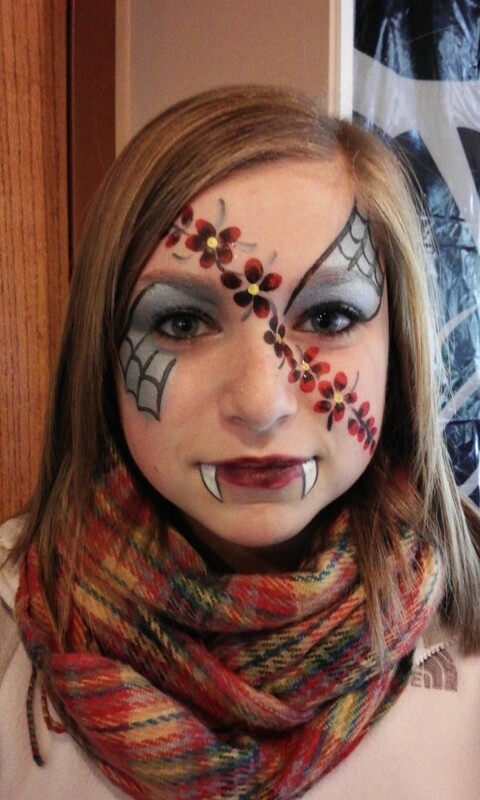 Our friendly painters love to paint full faces, quick eye designs and cheek art! One painter or more- we paint at small and large events. In business for over 10 years and well trained. We use only professional face paints that wash off with mild soap and water except for our glitter tattoos that are waterproof as soon as applied and last 4 days! Reasonably priced fun for your crowd! Dependable, professional and friendly- we'll work with you to make your event planning easy. Contact us and we'll get back to you soon with a price. We loved Lisa. She was very professional and very sweet. Her artistic talents were great and on point! I would recommend her to everyone. She was awesome! I have had the pleasure of seeing Lisa's work at many events and you couldn't find anyone better. In addition to being a very talented artist, she is kind and patient with both children and adults and is an absolute professional at her work. I highly recommend her! We just had a face painter and glitter tattoo artist for our twins birthday party and they made the party. They were professional, friendly, on time and did great work. It was worth every pennies and we were very bappy! Thank you to Lisa and your assistant for working the opening of our Athletic Complex at Divine Child! The kids really enjoyed the face painting! You made it special and customized the options for our event, which everyone really appreciated and enjoyed! I had several people ask for your contact information, so I hope to spread the good word about your work. Very professional, reasonably priced, and FUN! Thank you! Lisa is wonderful to work with! I found her company last year when I was trying to add entertainment to a fundraiser that we host annually at the Edsel and Eleanor Ford Mansion. She is very professional, always prompt with her replies and her face painting is fabulous! I would recommend her company to anyone seeking to do something more for their event. Thank you Lisa! I am so happy I picked Lisa to do my daughters 1st birthday party it was such a hit and everyone loved there faces! Also had a ballon lady that Lisa brought she was great!!! Parents even called me the next day telling me how much fun there kids had:-)) very professional and kind. Kept the kids entertained which was very important. Will be using them again for future parties! Thank you Lisa and Wendy! Flutterby Faces was such a pleasure to work with! Scott's talent and professionalism added so much to my daughter's 11th birthday celebration! I would recommend Flutterby Faces to everyone looking for a great company with fantastic customer service (both at our event and during the scheduling process)! We had almost 60 children and adults in our home and the face painters of Flutterby Faces handled the chaos, questions and children with great professionalism and ease. I would recommend them for any function, whether for kids or adults! We were so happy we chose face painting as an added surprise for our guests at our daughter's third birthday party. Lisa was absolutely wonderful, and painted each kid (and adult) quickly and beautifully. The kids were thrilled and we were so thankful for Lisa, such a sweet and talented artist. Recommended! Lisa was great to work with; on-time & professional. She did face painting for us for a corporate grand opening family event. Lisa was great with the kids and did beautiful work. It was a big hit! Just great! I feel lucky to have found such a wonderful talented professional. Great work and fast. Everyone commented on the beautiful works of art. Will hire again when the opportunity arises. Highly recommended. Thank you so much for everything. Your work was perfect. You ensured that even the same requests of a design didn't go without each one being unique. You were a diligent worker that made the atmosphere extremely comfortable and fun. You showed up early, prepared an excellent set-up, and stayed until you've completed the last of your work. From young children to adults, everyone thoroughly enjoyed your company and artistic skills. You've succeeded in making this day complete. You will continue to be highly praised and suggested. Thank you for your time, beautiful work, and conversation. I used Flutterby Faces for my daughters 4 th birthday party. What a fantastic Idea....the kids LOVED it and so did the adults. Lisa is great with the kids and the face painting was amazing!!!!!!! Will definitely do it again! Lisa is excellent, entertainment for all ages. Lisa was there face painter for my daughter's 18th birthday. Since the party included all ages she had designs to fit everyone's interest. Things we so well she ended up staying an additional hour. There was waterproof temporary tattoos, beautiful glittery designs and full face art. I will hire her again and highly recommend to others. Lisa went out of her way to donate her time to a very important event. Entertainment Express asked her to donate her time to our annual event for a Christmas party for "Families of fallen police officers." She did a WONDERFUL, AMAZING, SPECTACULAR Job! The children enjoyed her services as much as the adults. We will definitely utilize the services of Flutterby Faces in the future! Once again Thank you guys so much for your donation, it is very much appreciated! I booked flutterby faces face painting for my sons 3rd birthday party. From the time I searched and found them up until the party, it was a pleasent experience! Lisa was very professional and did a wonderful job. She had a great selection of face painting art for the kids and adults to choose from. The Manager of the restaurant where the party was held was so impressed with the work she asked for Lisa's info so that she could book her for her daughters birthday party! Also 4 other parents wanted to book her as well. The overall experience was awesome and I would ABSOLUTLY book Flutterby Faces again! Flutterby Faces was very friendly and great to work with. The kids really enjoyed them being at the event. The face painting made my daughter's day extra-special. I appreciated that Flutterby Faces told me up front that the design my daughter selected would be covered by her bangs. The artist told me she had an idea...asked me to trust her....and did her thing. The outcome was great! What a talent (and what nice ladies too)! Thank you Flutterby Faces! I can't say enough about how pleased we were with Flutterby Faces! 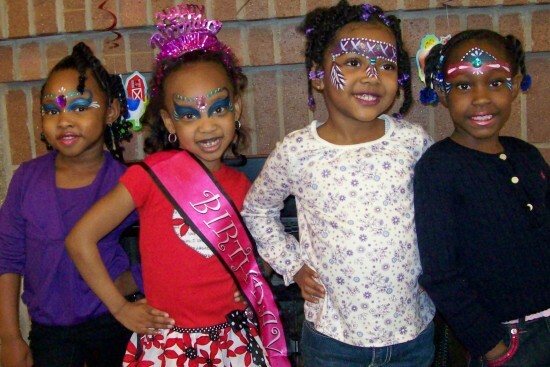 This is the second birthday party that they've done for us, and they were a big hit at both events. Professional, great with kids, dependable...and the designs are truly works of art. I give Flutterby Faces my highest recommendation! Flutterby Faces Face Painters have been painting at multiple events in our community for many years. They are professional, caring and the children and families look forward to seeing them each time they visit during our special events. Their designs are beautiful and each one is unique. 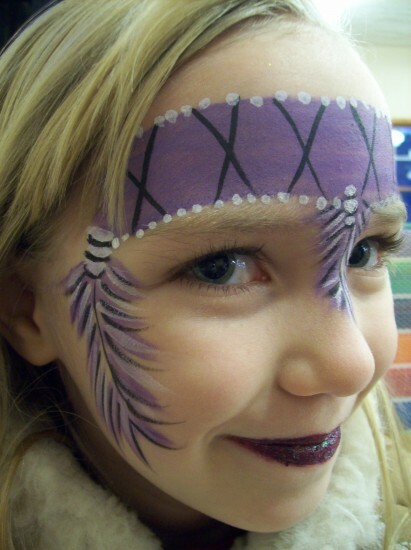 They will tailor their face painting designs based on the request of the child or the theme of your event. They are reliable so if you advertise that they will be there, they will! We have never been disappointed. November 17, 2015 • 7:00pm - 8:00pm Our busiest year yet! Lots of new corporate and individual gigs.